Dr. Nick Petrella is a recognized expert in percussion education with a long list of credentials, including that of percussion coach for the World Youth Orchestra in both Switzerland and Taiwan, developer of the percussion pedagogy course at England's Royal Northern College of Music (a first of its kind in the UK), and five years as the Director of Percussion Studies at Texas Christian University. Currently the Band & Orchestra Educational Director for SABIAN, Nick also finds the time to commission new music as a member of the faculty at Oakland University. He has written numerous articles published in US and European music journals and is also in demand as a clinician, teacher, and performer throughout North America, Europe, and Asia. 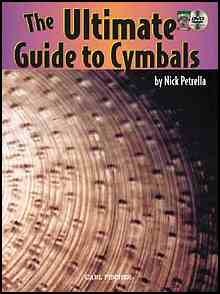 And with all that, Nick still found the time to author this book and DVD called The Ultimate Guide to Cymbals. Nick says he wrote this guide in response to the many cymbal-related questions he has received from music educators and percussionists over the years. Personally, I feel that nothing adds to the tonal range and "colors" of percussion quite like cymbals. When I first heard about this book I was thrilled that someone finally gave cymbals their due. Let's take a detailed look at The Ultimate Guide to Cymbals and see if it lives up to its title. This introductory chapter, written by Michael Meckna Professor of Music History at Texas Christian University, covers the cymbal through the years from its earliest beginnings in India, circa 3000 B.C., to their appearance on the drumset in the 20th century. From initial casting to final labeling, each step of the cymbal making process is explained and illustrated both in the book and on the included DVD, courtesy of SABIAN. Cymbal weight, size, and anatomy as it affects the timbre of the cymbal are discussed. Also covered are the best ways to select and audition suspended cymbals. Tips for achieving a desired sound from your suspended cymbal. This chapter details the use of various implements that can be used to play cymbals; the types of strokes, rolls, muffling used; and special "extended" techniques. This section details the weight, sizes, and anatomy of hand cymbals including advice on choosing a good pair. I found the info pertaining to finding and marking the lightest area on each cymbal very interesting. Includes tips for achieving a desired sound from your hand cymbals to help you develop fluid and graceful motion. If you're one of the percussionists who were taught to think of a flam when practicing hand cymbal technique, you'll benefit from the more effective method Nick explains in this chapter. Nick also covers ways to relieve tension when playing hand cymbals, various cymbals grips, and playing techniques (including hand cymbals attached to a bass drum). This chapter also contains details on many additional techniques to help you produce the most musical sounds from your hand cymbals; the proper use of straps, pads, and grommets; cymbal placement in ensembles; and proper music and tray stand placement. In this chapter Nick offers realistic methods for choosing the best marching hand cymbals, proper design and use of straps, pads, and grips along with techniques to help you get the best sound production. Also covered are the importance of visual effects to the appearance of marching ensembles; correct cymbal placement both in the batterie and in the front ensemble (or pit); and the use of marching cymbals in indoor drumlines, which have gained in popularity over the past few years. This chapter begins by taking us to the included DVD for a discussion with Dave Weckl about his cymbal set-up, followed by a solo demonstrating the sounds of his various cymbals (excerpted from Dave Weckl's video A Natural Evolution). The remainder of the chapter covers each of the six different types of drumset cymbals; brilliant cymbal finishes and their effect on cymbal sound; and proper set-up of your drumset cymbals to prevent damage and achieve the best sound. Techniques for playing these predecessors of modern cymbals are included in printed form and on the accompanying DVD. Crotales or pitched "antique" cymbals, as they are also known, are demonstrated both in the book and on DVD. This chapter contains tips to help you keep your cymbals looking and sounding like new. Included are suggestions on cleaning, storage, and transportation. Also covered are ways to deal with stand noise, how to correct inverted cymbals, and ways to fix cracked cymbals. Suggestions for choosing cymbals for a particular piece are included along with other practice and performance tips. This appendix gives detailed advice on appropriate cymbal purchases for elementary, middle school, and high schools along with a recommend minimum inventory for hand, suspended, and drumset cymbals. Nick Petrella interviews noted educators/percussionists on the included DVD with questions centering around cymbals. This is a complete listing of what's on each of the 59 tracks included on the accompanying DVD. Books and Web sites to increase your knowledge of cymbals, percussion, and musical instruments. Alphabetic listing of common terms used when talking about cymbals. I was impressed both by the amount of practical information in the book and the additional info on the included DVD. So, did the book live up to its title? Yes. From insightful video interviews with professionals such as Dan Armstrong, Bill Cahn, Gary Cook, Dennis DeLucia, Arnie Lang, Ney Rosauro, David Via, and John Wooten to a factory tour detailing the making of a cymbal (courtesy of SABIAN) to demonstrations of cymbal technique featuring Nick Petrella and other artists, The Ultimate Guide to Cymbals is just that, a guide covering everything you need to know about cymbals from Attack to Zischen. I highly recommend this book/CD combination to educators looking for detailed information on the selection and use of cymbals for their bands, and also to percussionists who want to expand their knowledge and technical ability. Although mainly aimed toward the marching band and orchestral percussionist sector, the drumset player will find valuable info here as well, including money-saving tips on repairing cracked cymbals. Until next time: Stay loose!